The Monasteries of Haghpat and Sanahin represent a fusion of vernacular and Byzantine ecclesiastical architecture. Both monasteries are located in the Debed Canyon, in the Lori-region of North Armenia. Their oldest structures date back to the 10th century. Haghpat also has a number of splendid khachkars (cross-stones) of the 11th-13th centuries standing on the territory of the monastery. In 1996, only Haghpat was inscribed. The site was extended to Haghpat and Sanahin in 2000 after the ownership of the latter monastery became clear. These are two of the many monasteries / churches in the Debed Valley that I saw on a daytrip from Vanadzor. I had rented a taxi to take me there, and was transported like a royal (in the backseat of an authentic Volga). After an hour or so, our first stop was Sanahin. 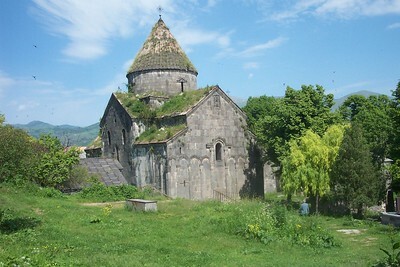 This monastery is situated on a hill top in the outskirts of Alaverdi. Amidst the apartment buildings it wasn't easy to find. Up and close however it's a fine sight in a tranquil environment. The friendly lady with the key showed us around, explaining every detail to the driver (me not understanding a word because of a huge Armenian-Dutch language barrier, both sides used to a different lingua franca (Russian-English)). Like so many other Armenian churches, this one is also blackened inside from fires. 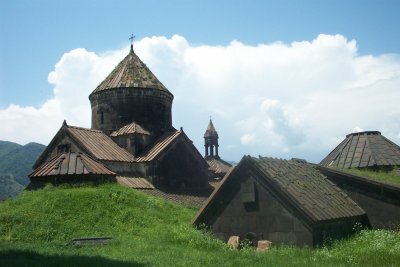 Haghpat monastery is on the other side of Alaverdi. It's more of a landmark than Sanahin, but I wouldn't want to choose between them. Its church holds a faded fresco of Christ above the altar. Both Haghpat and Sanahin are large complexes, that hosted facilities like a library, a dinner hall e.a. Khatchkars can also be found, not all in very good condition. The Haghpat complex is partly overgrown by grass and flowers, a treat to the eye in spring time. 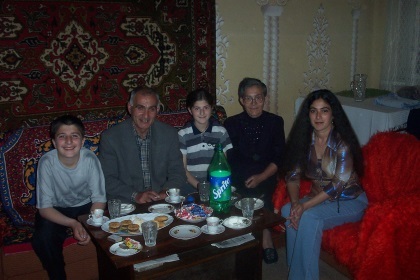 On our way back the driver Valera invited me into his home in Alaverdi and meet his family. They were a bit surprised of course, finding a turista on their doorstep. I was fed cookies and icecream, and took a picture of the whole beaming family in return. To see how this family lives, in a crumbling Soviet-apartment block close to the huge Alaverdi mine, really was an eye-opener. Their living conditions to an outsider look saddening, but inside the four walls of the family apartment all seemed pleasant enough. Because of the hospitality I experienced here, this one has become a truly memorable visited WHS. Sanahin sits high above the industrial town of Alaverdi, a “Soviet” city built in a deep valley on 2 levels joined by a road and cable car. When we were there in August 2000 the city appeared to be suffering from the total run down of its industrial base and gave off a depressing air with its badly built Soviet apartments showing huge cracks in their walls perhaps dating back to the earthquake of 1988! It is set deep in the mountains towards the Georgian border and one wondered what economic logic there could be under a capitalist system for an industrial centre there. In the churchyard modern graves showed that the church was in use and, in a style we had come to recognise in Russia, were marked by finely etched pictures on stone depicting the deceased and often their circumstances of death. One I remember showed graphically the death of a whole family as their car careered off a mountain road! Hagphat is a few miles further on in more rural surroundings and is perhaps the more pleasing of the 2. Both are quintessentially “Armenian” – with an atmosphere very different from Catholic or Orthodox monasteries and which needs to be experienced to be understood. 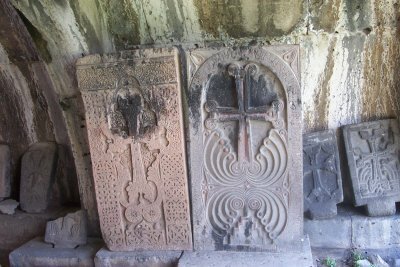 The “Khatchkars” are a particularly noteworthy feature – uniquely Armenian carved crosses which act as gravestones or memorials and which crowd upon each other on walls and in the churchyard. Neither site, however, approaches the scenic grandeur of the Sevan Monastery which is beautifully situated on a lakeside and often figures in tourist brochures and posters for Armenia. But for some reason that is not a WHS!